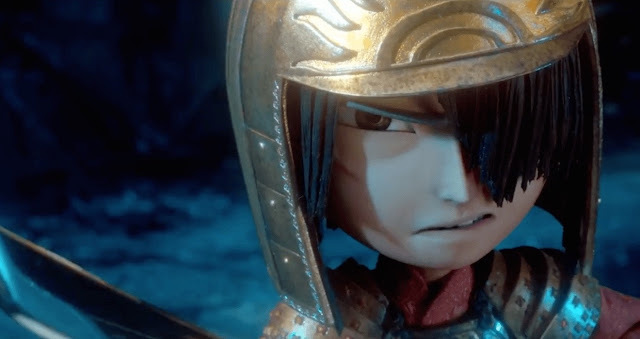 Laika Entertainment, the Portland-based stop-motion animation studio, has made another beautifully magical film exploring feudal Japanese mythology and samurai legends in a decidedly western action/adventure style. Kubo and the Two Strings combines splendidly so many different elements of cultural storytelling in a poetically emotional story of family history and personal heroism. In their fourth feature, after Coraline, ParaNorman, and The Boxtrolls, Laika CEO/director Travis Knight and co-writers Marc Haimes and Chris Butler take the hero's journey into refreshingly original territory wasting little time in introducing us into a closed world of mythical powers and a violent but mystical family history. Kubo, our hero, tells and retells fantasy stories within the context of the story we are watching filling in gaps, twists, and connection as we go along. The almost entirely non-Asian voice cast is nonetheless effecting in their performances with Charlize Theron and Art Parkinson anchoring the emotional journey of a maternal monkey guide and magical child warrior well balanced out by a fairly restrained Matthew McConaughey as sidekick Beetle in a fun vocal perfomance. Rooney Mara and Ralph Fiennes also show up in nightmarish fashion as mysterious, villainous souls and antagonists. Kubo is a gloriously wondrous craftwork of detail and heroic imagery. The way Laika and Knight have crafted this uniquely original tale of heroes and family is thrilling and emotional. Full of ambition and an energetic spirit, the animated film feels instantly classic in its economically paced visual storytelling and rich narrative. It's a beautifully rendered and dream-like work of stop-motion animation adventure.